Hi there, this was a few months ago now, I had forgotten all about the pic, just thought I’d share it with you. Sneeky girls. Well, hello to you all, she has evaded me now for 8 days, Saturday, no where to go, but sit and watch her til she goes to lay, but i didn’t do that, i was busy catching 3 other birds in the neighbours garden, chasing them back over the fence, during the comotion, Daisy seized her opportunity to slip off to her secret nest, sure enough by the time i had sorted the other 3 out, she had disappeared. I walked down to where i last saw her, nothing, but then i stumbled on some branches and nearly fell into a nearby large bizzy lizzy plant, apon doing this a few clucks came from the aforementioned bush, which only 2 days ago i had taken some cuttings from, and there she was sitting in the now not so secret nest, i did my best to pretend i hadn’t seen her, and went about adding to the new coop. Finally she emerged from the bizzy lizzy to see what i was up to, I gave them a handful of feed, to keep them occupied, and went to investigate, low and behold, 9 eggs, it felt like christmas had come early. I let out a loud wooping sound, neighbours probably think i’m a bit cookoo. Well excited doesn’t describe it, i rushed 8 of the eggs upstairs, straight into a pan of water, all good. If your wondering why only took 8, I figure if i leave one there, she keep going back to it, and not go off to a new hiding spot, a have made clay eggs for the others nesting spots. 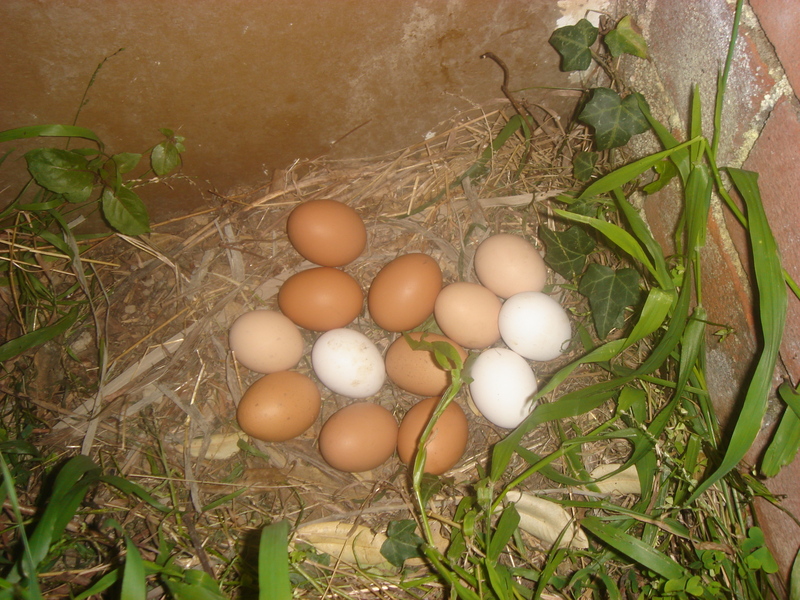 The street did well today for fresh eggs, i give the excess away to the neighbours. ‘Alls well that ends well’ said Shakespeare, i wonder if he kept chickens? Hi there, this week i seem to be faced with a new problem, when keeping chickens, Daisy, one of the regular layers, has taken to going off to a secret nesting spot, that only she knows. It’s been a week now, so i imagine there will be a clutch of eggs to collect when i do find it, however time is not on my side, as the weather is warming up, these eggs will not last forever. Plus she doesn’t print a use by date on them, so i will have no way of knowing which was first and last to be laid. On other related matters, i’m in the process of upgrading the coop, earlier readers will know that at current the ladies roost in an self made ark type arrangement, which is suffient for their purposes of somewhere safe to sleep, however i find it slightly impractical for my needs, i.e cleaning it. So i have aquired more free palets from the friendly plumbing world in new lynn, and i am setting about building a deluxe- coop. I will let you know how i get on.